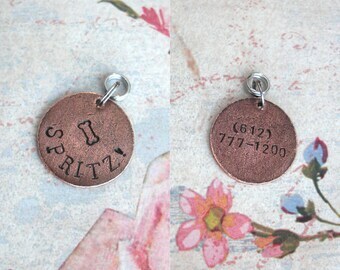 Custom Hand Stamped Charms by Tipsy Whimsey :: Quick! Announcement Happy Spring! Hi, Charmer! Tipsy Whimsey is available in the studio Monday-Friday, during regular business hours. Most orders are ready to ship within 2-4 business days; First Class shipping after that can take 3-5 business days in the U.S. (it can take 7-10 days on average to receive your order after purchase) *** Need it faster? Please Upgrade your shipping options during checkout. Select RUSH + PRIORITY for fastest possible turnaround. PRIORITY already includes insurance on your package. (You MUST add insurance to your First Class shipping to receive compensation if the USPS loses or damages your package.) Priority shipping upgrade linked below. ♥ All orders are custom! Just type up your details during checkout. 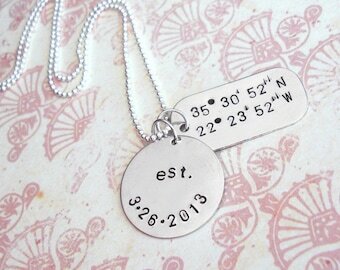 ♥ I will stamp and ship out your order within four (4) Business Days ♥ This is my gift to you: Quick turnaround! Please explore ALL shop sections, you may find the perfect combination in unexpected categories. These shop sections just show off a sampling of what I offer. I'm happy to answer your questions. No need to submit a custom order request unless you need something that is far, far off from my listings. My listings are "made to order" and are already ready to be customized. Be sure to give me instructions of what to stamp in the comments section during checkout. Follow me @tipsywhimseyshop on Instagram, or at www.Facebook.com/TipsyWhimsey to see current specials. PRIORITY SHIPPING IN THE U.S. Detailed directions on looking up your GPS coordinates, check it out! ♥ What Does Handmade Really Cost? ♥ Every day I work my hardest to make something unique and beautiful, just for you! 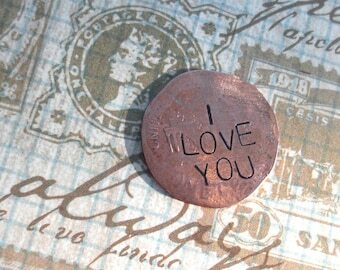 ♥ I hope that you enjoy every aspect of your handmade item. Thank you so much for shopping with me. Happy Spring! Hi, Charmer! Tipsy Whimsey is available in the studio Monday-Friday, during regular business hours. Most orders are ready to ship within 2-4 business days; First Class shipping after that can take 3-5 business days in the U.S. (it can take 7-10 days on average to receive your order after purchase) *** Need it faster? Please Upgrade your shipping options during checkout. Many thanks to you, my dear Charmer! Not only do I love charms & birds, I ♥ bird charms! My last craft show in 2012 featuring one-of-a-kind jewelry designs. Can I sum up Tipsy Whimsey in one sentence? I cannot. I founded Tipsy Whimsey back in 2006 when I started a line of greeting cards featuring my photography and drawings. That evolved into other crafts such as my unique photo ornament design (shown here in my other craft shop: https://www.etsy.com/listing/58444961). Why the 'e' in whimsy? It felt more playful and whimsical to use the old English spelling. My original logo was a bubbly martini glass. The 'e' in Whimsey was even tipped a little because we're all a tad askew and that's our fun side. My new owls are a little tippy, too! I've always dabbled in creating jewelry, from my kid years through high school. For Christmas 2007 I made cute earrings for friends and family... and decided to launch them on Etsy in 2008! My studio exploded with beads, tools, designs and vintage pieces awaiting their rebirth. Many of my original jewelry designs can be found in the photo albums on Tipsy Whimsey's Facebook page (copy & paste this direct link: https://www.facebook.com/tipsywhimsey/photos_stream?tab=photos_albums). I sold my one-of-a-kind creations online and in person at craft shows. 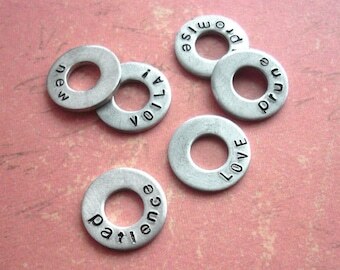 Along this adventure I started playing around with stamping metals, coins and Scrabble Tiles (found in my other craft shop: http://www.tipsywhimseyART.etsy.com). Slowly and surely my stamped creations were finding themselves all over the world (BTW, I feel so blessed to interact with people from around the globe. Hi, entire planet!). Now my studio has grown even more with tags, metals, stamp sets and crazy tools like hammers, anvils and even a torch. 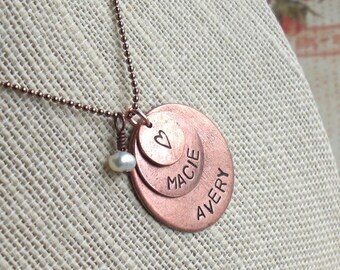 ♥ I absolutely love that each piece has a personal story - YOUR story. I genuinely enjoy chatting with you and helping to preserve these moments that have shaped your life. I'm always testing out new ideas and find that there aren't enough hours in the day for me to get them all listed here. Definitely email me with questions and check out my Facebook page or Instagram (www.facebook.com/tipsywhimsey or @tipsywhimseyshop) to see a variety of products. To support myself with my craft is truly amazing. Thank YOU so much for being a part of MY Tipsy Whimsey story. We all have so many different talents. I find it inspiring to see so many artists working hard at what they love. We each have something unique to offer here on Etsy and I'm thrilled to have you visit my shop! To keep your jewelry and charms looking their best, be sure to keep them out of water and stored safely in something like a jewelry box. Please note that I do not verify the accuracy of your coordinates. Please note: Once you have submitted payment your order is finalized. I'm happy to make changes to your stamping request BEFORE I have stamped. If I have stamped the charm(s) already you'll need to purchase a new charm or charms. If you want to cancel your order but it has been stamped already, but not yet shipped, then I can refund the cost of shipping only. Email me at Tipsy [!at] Roguephotography.com or Etsy Convo me ASAP if you have changes. Thanks! Email me to request an image with a quick tutorial on how to open a jump ring. 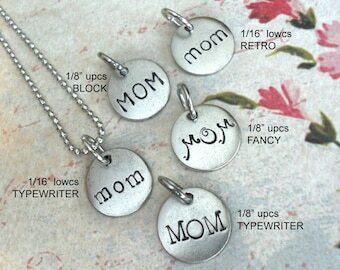 You may need to open one to add a charm to your bracelet or a special chain. Be sure to "Like" my company on Facebook to receive updates on future savings! 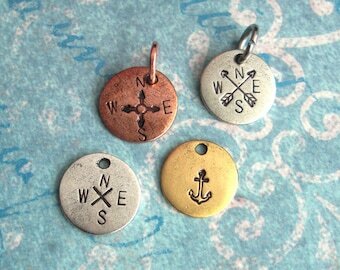 www.facebook.com/tipsywhimsey ~ click on "Like" and then "Get Notifications"
PLATING: Most of my charms are plated with genuine .999 fine silver, genuine copper or 24K gold. Plating is only one molecule thick so it can wear thin. Don't rub or wash your charms. Email me with questions. Copper tarnishes. Simply from the air. Moisture, salt water air, your skin's PH balance, your lotions and perfume, touching it with the oils on your hands, the pool... everything tarnishes everything. Avoid wearing it overnight or in the water to preserve it as long as possible. 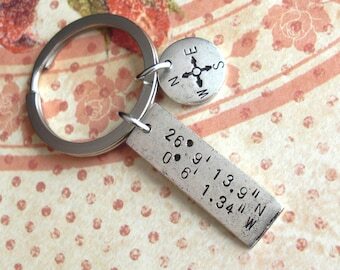 THE FINISH: Please note: Unless otherwise noted your charms are plated metals with an antiqued finish. Please keep out of water and away from lotions or perfume to help preserve them. KEYCHAIN TIP: If you are ordering your pendant without a key ring, but plan to put it on your own key ring, please let me know in your comments during checkout. I'll be sure to put a heavy-duty jump ring on there for you. Wire wrapped rings may fit a smidge tighter/looser than your normal size, simply because the coils grip your finger differently than a traditional band. Please visit my Profile page to read more about me and my ramblings! This is a treat and a gift. Please don't share with small children as it can be a choking hazard. Please read about the product first on their website before eating if you have any questions. CHANGES TO YOUR ORDER? : Once you have submitted payment your order is finalized. I'm happy to make changes to your stamping request BEFORE I have stamped. If I have stamped the charm(s) already you'll need to purchase a new charm or charms. If you want to cancel your order but it has been stamped already, but not yet shipped, then I can refund the cost of shipping only. Email me at Tipsy [!at] Roguephotography.com or Etsy Convo me ASAP if you have changes. Thanks! Please feel free to share your contact information including a phone number with Tipsy Whimsey. Tipsy Whimsey will never sell or lease your data to anyone! Tipsy might need to contact you about your order details, or offer you a special discount in the future. Also know that Etsy handles all credit card transactions and Tipsy Whimsey does not have access to your payment information.